What is a 'keyhole', anyway? Also: Closeup showing Low Gain and High Gain Antennae, high-res TIFF version. You may at times notice something unusual about the SOHO Near Real Time Images: They don't update the way they "always" do, and EIT images are replaced by signs saying "CCD Bakeout". All of this, and the only explanation is that "SOHO will be in a telemetry `keyhole'"? First things first - all is well with SOHO and its instruments. In fact, those interested enough to read our calendar or the minutes of our planning meetings (see the Operations page), will have realized that the lack of fresh images came as no surprise to the SOHO science community. And they may have stumbled across the rather cryptic terms "keyhole", as in "keyhole period" or "keyhole operations". The term "keyhole", in antenna terminology, stems from a characteristic feature of aerial navigation maps showing the coverage of e.g. a radar antenna: A circular area near the antenna is shaded due to too-short range. In addition, any obstructions (hilltops, buildings) near the antenna will cause wedges to be shaded due to lack of coverage. Taken together, the appearance of the shaded area is often that of a keyhole. The term has since been generalised to refer to any area not covered by an antenna. And what does this have to do with SOHO? 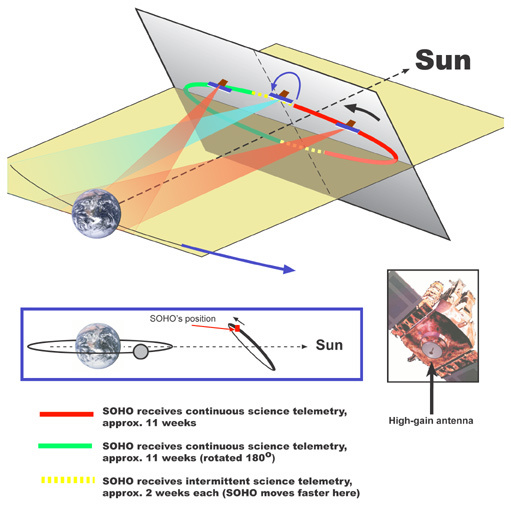 In order to get a good downlink signal, SOHO's High Gain Antenna (HGA) needs to be pointed correctly as the spacecraft traverses its highly elliptical orbit around the L1 Lagrangian point, some 1.5 million kilometres sunward of the Earth. In early May 2003, the HGA started showing signs of trouble. Its East-West pointing mechanism started missing steps, eventually triggering an on-board protective action that reconfigured the spacecraft to use its omnidirectional Low Gain Antenna (LGA - see closeup). This configuration, which gives a much weaker signal at Earth, was only meant to transmit low rate data, sufficient for health monitoring and engineering but containing no science data. Since the HGA was not far off the intended pointing, high rate science telemetry could soon be restored, but a long period of troubleshooting and testing started, while the antenna pointing mechanism performance seemed to degrade (see links below for details). In the end, it was concluded that an undetermined mechanical problem was indeed the cause of the problems, and the antenna appeared to be stuck. However, it could still be moved using the primary and backup drive motors at the same time, doubling the torque. The problem is, nobody could say how long that would last! So, a strategic decision was made to park the antenna at the "sweet spot", which maximises the time during one half-orbit when the signal is strong enough for normal use. By turning the spacecraft up-side-down during the other half of the orbit, the coverage is doubled! But when SOHO is in the "middle" parts of its orbit (see figure), there is no way it can point at the Sun while also pointing its HGA towards Earth. SOHO has "keyhole periods", occurring twice per orbit. Each orbit around L1 takes about half a year, so keyholes affect SOHO operations roughly every 3 months. In late June 2003, as the first keyhole period approached, instruments prepared to shut down in various safe modes for a two-week period with only low rate telemetry. 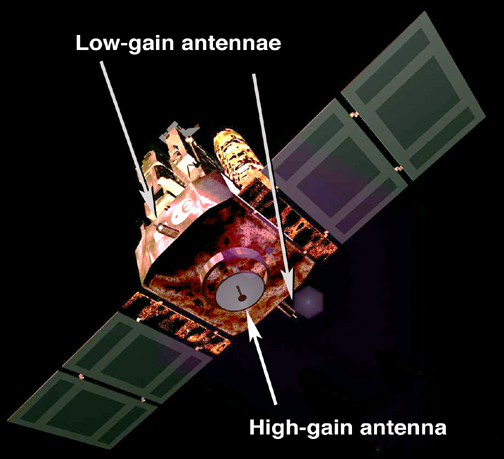 However, a number of discoveries about the spacecraft's and the Deep Space Network (DSN) stations' capabilities were made: Using larger 34-meter stations with better receivers instead of the standard 26-meter stations, SOHO could keep beaming high rate data through the HGA for a few days extra on each side of the keyhole. When the HGA finally had to be abandoned for the LGA, it turned out that 34-meter stations could actually pick up medium rate telemetry, not just low rate telemetry. During normal operations, SOHO always sends high rate telemetry to Earth when in contact with a ground station. While SOHO is not in contact, data from all experiments is recorded on board at what is called medium rate. The recorder is dumped at 3 times the recording speed using the extra capacity of the high rate signal. When the medium rate recording has been secured, the extra capacity is used by the MDI instrument to send higher resolution magnetograms, Dopplergrams and white light images, which do not fit in the medium rate signal. So while the medium rate telemetry through 34-meter stations was very good news, it still meant there would be gaps whenever SOHO was not in contact. With no capacity to dump the recorders, the total capacity of 16 hours would fill up quickly. But DSN also has 70-meter stations - and they could in fact lock onto the high rate signal while using the LGA. We were back in business! With enough support from 70-meter stations, SOHO could have lost the HGA entirely and continued as before. But the larger DSN stations do not stand in line at your service all the time! Although SOHO's second keyhole (fall 2003) had so many 70-meter passes lined up that the data loss was negligible, this was highly unusual. With the Mars and Stardust missions competing in a different league of priority, SOHO has had to do with almost no 70-meter stations during subsequent keyholes (and there's not much relief in sight). Although the amount of observing time lost is not all that great, considering the length of the mission, it matters a lot to a few instruments: MDI, GOLF and VIRGO have long-term helioseismology programs that are severely affected by gaps in the data. VIRGO also has important calibrations of its Total Solar Irradiance observations 3 times every day. These can be secured by stretching the 16-hour recording capacity to its maximum, recording those calibrations that are not captured by real time contacts. Other instruments that typically analyse their data in time-series are also affected, of course. Continuous data sets are in fact so important to GOLF and VIRGO that they routinely send 3 copies of each measurement: one real-time copy and two delayed copies. Thus in theory, if you control the times of the telemetry capture, only one third of the telemetry is needed for a continuous sequence. This fact, plus a few 70-meter stations to dump the recorder every now and then, makes it possible to preserve the continuity of their data during some keyholes (assuming not too many things go wrong with the ground stations!). MDI is also hit hard by keyholes: They normally use the high rate time that is left after dumping the recorder for dowlinking all the MDI images that are shown on our real-time pages. And since there's no such time left over during a typical keyhole, they are faced with an almost total blackout. They do have some telemetry coming down in medium rate, though, and they have been able to redirect the 96 minute cadence magnetograms to be downlinked in this portion of their telemetry, but this is not possible for the MDI Continuum images. Please follow this link for an updated table.